Anyways xy's.... this show truly made me realize the full potential of cooking, i traveled to the foot of Mt Everest in some l trading market with local Himalayan natives for coco powder and transverses the Matterhorn in Switzerland and found a mountain goat and extracted its milk from its wholesome breats and melted this concoction in a stone oven in Paraguay and made chocolate that gave Judge Judy a heart palpitation and i made it on the Wendy Williams show for my success, thank you rupaul. 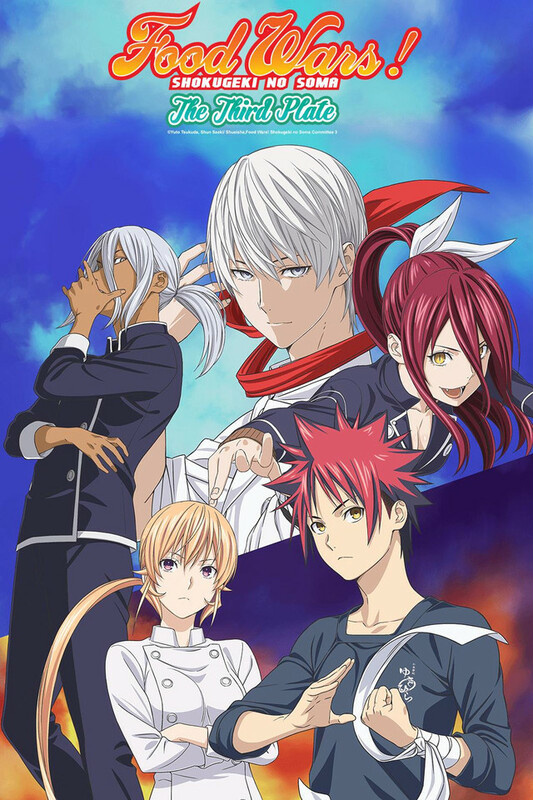 Both the Manga and the Anime for Shokugeki No Soma are engaging and captivating. Each arc continues the storyline nicely and makes you care more for each of the characters. You will easily get caught up in their trials, successes, hardships, and relations. I love it. Both in terms of animation and of story, this one is a cut above everything else. I personally could do without the exploding clothes which I think only serve to slow the pace of the story but that's a minor point for me. Even with a lot of characters at play, most are well enough developed that you care about what happens to them. And lets not understate the educational aspect of the show - I have learned more about Japanese and many other styles of cuisine than I would ever have otherwise. This show is hilarious, I can't count the number of times it made me laugh. I hate normal cooking shows but I can watch this all day. Also it gives you interesting facts and techniques for cooking at home. this best thing my senses have interacted with very good on my top 3. Started for the absurdity, stayed for the story. When I first heard of Food Wars, it was in a comment of a thread with a gif of someone eating food and their clothes exploding. It was ridiculous over the top, and I couldn't believe it was an actual show and not just a parody. So I decided to see the full thing,,, and I was hooked. I love the character progression and the cast. Even though there can be a lot of characters, they are unique and each have their own strengths. The show can be so over the top and that's what makes it amazing! I really hope there is a 4th season of the anime, and I'll probably rewatch these episodes more than a few times in the meanwhile. Damn! All the episodes made me want to watch more! Although some Shougeki matches can be easy to predict, I really liked the suspense in most of the episodes. I really mourn the fact that I finished it in less than a week but I hope there are other animes like this one. So, in my opinion this is a must watch anime! I love this series from the moment that I first started watching it I knew that it was going to be an awesome anime. I couldn't just stop watching I have even gotten some friends to watch it they liked it as well just watching this would get anyone into cooking food whether it be at home or maybe even professionally.